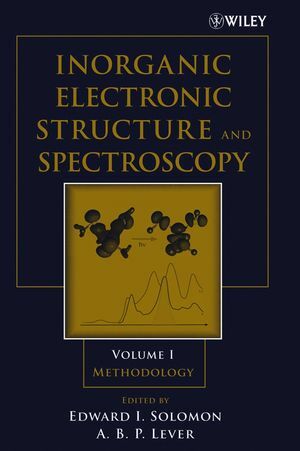 This newly available paperbound edition of Inorganic Electronic Structure and Spectroscopy includes all the material from the original clothbound edition published in 1999. Consisting of articles contributed by outstanding scientists from around the world, Volume I, Methodology presents the state of the art in this field, written in a style accessible to the well-read senior undergraduate, and yet still of superior value to the senior researcher. This work assumes a basic understanding of quantum chemistry and group theory and reflects the current state of development for many of the techniques used by practicing inorganic chemists. Although written by multiple contributors, the editors' holistic approach to the manuscript has ensured a uniform presentation. Edward I. Solomon is a Monroe E. Spaght Professor of Chemistry at the Standford University Department of Chemistry. He received his BS in 1968 from Rensselaer University, and his Ph.D. in 1972 from Princeton University. His research emphasizes the detailed application of a wide variety of spectroscopic methods combined with molecular orbital calculations to probe the electronic structure of a transition metal complex and its relation to physical properties and reactivity. Three areas of physical-inorganic and bioinorganic chemistry are of general interest: chemical and spectroscopic studies of metalloprotein active sites, detailed spectroscopic and electronic structure studies of high symmetry transition metal complexes, and development of synchroton spectroscopies (at SSRL) to solve important problems in inorganic chemistry. Professor Solomon is an Alfred P. Sloan Foundation Fellow, 1976-79, an Associate Editor for Inorganic Chemistry, and has received a number of other honors throughout his career. Alfred Barry P. Lever is a Distinguished Research Professor (Emeritus) in the Department of Chemistry at York University in Toronto. He received his Ph.D. in 1960, from the Imperial College of Science and Technology in London. He is the Founding Editor of the journal Coordination Chemistry Reviews. This journal offers rapid publication of review articles on topics of current interest and importance in coordination chemistry, which includes aspects of organometallic, theoretical and bioinorganic chemistry. Professor Lever was, amongst other things, a Killam Research Fellow from 2000 through 2002, and was the 2002 recipient of the prestigious Linstead Award for Career Achievements in Phthalocyanine Chemistry. 1. Ligand Field Theory and the Properties of Transition Metal Complexes (A. Lever & E. Solomon). 2. Electron Paramagnetic Resonance Spectroscopy (A. Bencini & D. Gatteschi). 3. Mössbauer Spectroscopy (P. Gütlich & J. Ensling). 4. Polarized Absorption Spectroscopy (M. Hitchman & M. Riley). 5. Luminescence Spectroscopy (T. Brunold & H. Güdel). 6. Laser Spectroscopy (E. Krausz & H. Riesen). 7. IR, Raman, and Resonance Raman Spectroscopy (R. Czernuszewicz & T. Spiro). 8. Photoelectron Spectra of Inorganic and Organometallic Molecules in the Gas Phase using Synchrotron Radiation (G. Bancroft & Y. Hu). 9. X-Ray Absorption Spectroscopy and EXAFS Analysis: The Multiple-Scattering Method and Applications in Inorganic and Bioinorganic Chemistry (H. Zhang, et al.). 10. Electronic Structure Calculations on Transition Metal Complexes: Ab-Initio and Approximate Models (C. Martin & M. Zerner). 11. Electronic Structure Calculations: Density Functional Methods with Applications to Transition Metal Complexes (J. Noodleman & D. Case).